Last week brought news that a New York City councilman has proposed legislation requiring licensure for cyclists. Then there was the proposal to ban cycling with child passengers in Oregon and another licensure call in New Jersey — both thankfully dismissed. Now a new bill has made its way into the Oregon statehouse and, once again, it conveniently sidesteps the foremost risk to cyclists: cars. Democratic Representative Michael Schaufler has proposed up to a $90 fine for cyclists caught in the deviant act of listening to headphones. What’s interesting about this proposal is that, the way it’s currently written, it would create an entirely new violation — “unsafe operation of a bicycle” — in the vehicle code. If passed, it’s possible that additional provisions could be added to this law in the name of safety. Another thing to keep in mind is that, because of the way our current cell phone law is worded, it’s unclear whether or not it applies to bicycle operators. 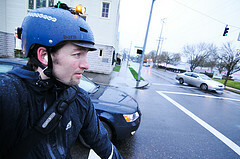 Maus has been soliciting comments from Bike Portland readers, who have made some interesting points. Would lawmakers better protect cyclists by trying to cut down on distractions for motorists — including, for instance, car audio systems? Elsewhere on the Network today: Copenhagenize discusses an especially ludicrous idea — banning winter cycling — put forth by newspaper commenters in Ontario. Ecocity Publicity Mobility introduces a new comic book illustrating car-free transportation options from around the world (you can see it in electronic form too). And American Dirt comments on the ubiquity of asphalt in America and its surprising effect on the natural environment.